Do You Speak Spanish At Home? Recent Study Says Language Declines Among Latinos In The U.S. According to a recent report from the Pew Research Center (PRC), more than 37 million Latinos in the U.S. speak Spanish at home. The results of the analysis of the 2011 American Community Survey shows that Spanish is the most spoken non-English language in the U.S.
Due to the overall growth of the Latino population in the U.S., the number of Latinos who speak fluent Spanish continues to increase, but the population of Spanish-speaking Latinos born in the metro areas of the Unites States in ages 5 and older has decreased. The San Antonio-New Braunfels and Phoenix-Mesa-Scottsdale metro areas had some of the largest declines, with the shares who spoke Spanish in each declining by 9 percentage points, as presented by the PRC. Despite this drop-off in use, most Latinos agree that speaking Spanish is a vital skill. In a 2011 Pew Research Center survey, nearly all Latinos said it was important that the next generation of Latinos in the U.S. speak Spanish. Yet many Latinos (71%) say it’s not necessary to speak Spanish to be considered Latino, a 2015 survey found. About nine-in-ten Hispanics spoke Spanish at home in Miami (90%) and McAllen (90%), contrasting the Denver metro area, in which 57% of Latinos spoke Spanish, the lowest share among the metro areas analyzed. The PRC also informed that Spanish use has also become less widespread among Latinos in the nation’s two largest metro areas by Latino population. In Los Angeles-Long Beach-Anaheim, home to more than 5.5 million Latinos ages 5 and older, 80% spoke Spanish at home in 2015, a decline of 3 percentage points from 2006. 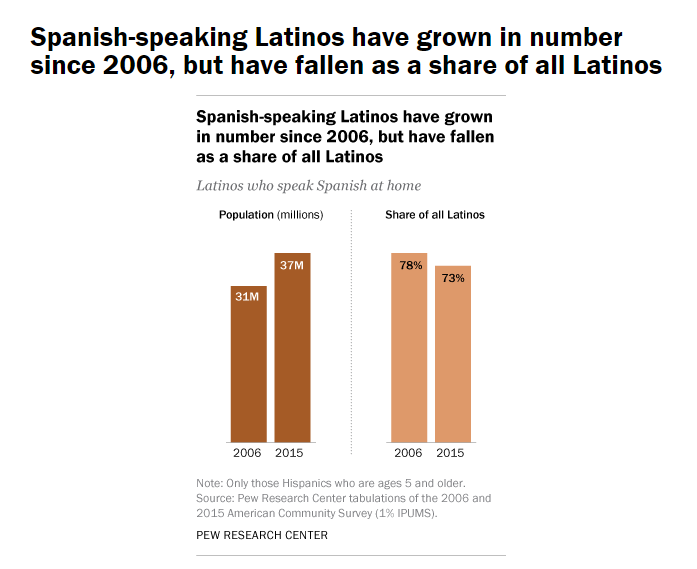 New York-Newark-Jersey City (3.6 million Latinos ages 5 and older) saw an even larger decline, with the share who spoke Spanish dropping from 85% in 2006 to 80% in 2015. The study also shows that 2.8 million of non-Hispanics in the US speaks Spanish at home. Some 59% trace their ancestry to non-Spanish European countries such as Germany, Ireland, England and Italy. An additional 12% say they are of African American descent. Nonetheless, about one-in-five (18%) non-Hispanic Spanish speakers trace their heritage to a Spanish-speaking country. By comparison, among the non-Hispanic U.S. population ages 5 and older, about two-thirds (64%) trace their ancestry to non-Spanish European countries, 13% say their ancestry is African American and 1% trace their heritage to a Spanish-speaking country.